LOS ANGELES • The number of those killed by mudslides in California was set to rise from at least 13 dead, but rescue efforts were expected to get easier yesterday after a powerful rain storm headed west and the skies cleared, the authorities said. Rescue personnel in Santa Barbara County yesterday morning continued searching for victims of the mudslides which had slammed into homes, covered highways and swept away vehicles on Tuesday. The mudslides were triggered when more than 1.5cm of rain fell in five minutes early on Tuesday, a rate that far exceeds the normal threshold for flash floods. The death toll of 13 is expected to rise. "While we hope it will not, we expect this number to increase as we continue to look for people who are missing and unaccounted for," Santa Barbara Sheriff Bill Brown said on Tuesday. 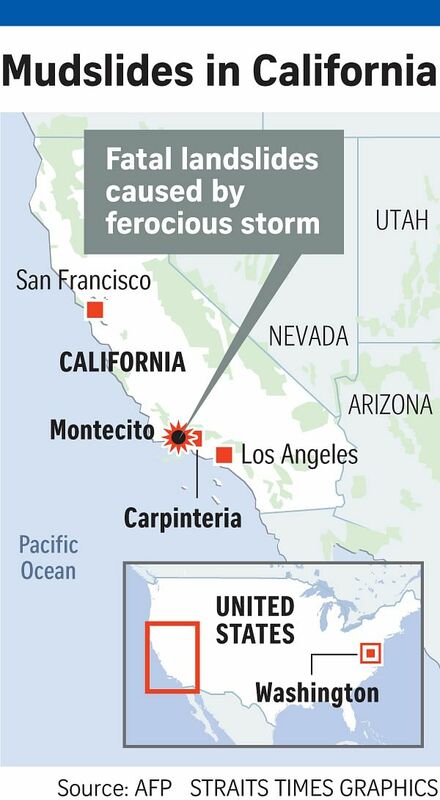 The upscale communities of Montecito and Carpinteria, just outside the city of Santa Barbara, were hardest hit. Over the past month, California's scenic coastline had been ravaged by a series of intense wildfires that burned off vegetation. The mudslides toppled trees, demolished cars and covered blocks of quiet residential neighbourhoods with a thick layer of mud, blocking Highway 101, a major north-south route along the coast. Emergency workers used search dogs and helicopters to rescue dozens of people stranded in mud-coated rubble in the normally pristine area, sandwiched between the ocean and the sprawling Los Padres National Forest, about 180km north of Los Angeles. "I thought I was dead there for a minute," teenager Lauren Cantin, covered in mud, said after workers spent six hours rescuing her, NBC News reported. Heavy downpours struck before dawn on Tuesday after 7,000 residents in Santa Barbara County were ordered to evacuate and another 23,000 were urged to do so voluntarily, some of them for a second time since last month. The county set up an evacuation shelter at Santa Barbara City College, where some people showed up drenched in mud, and also provided a place for people to take their animals. But only 10 per cent to 15 per cent complied with mandatory orders, said Ms Amber Anderson, a spokesman for the Santa Barbara County Fire Department. The number of fatalities surpassed that of a California mudslide on Jan 10, 2005, when 10 people were killed as a hillside gave way in the town of La Conchita, less than 32km from the latest disaster. Some local residents had to flee their homes due to the fires last month, and again this week because of the rain. Among them was Mr Colin Funk, 42, who sat up watching mud and debris approach his Montecito house overnight and fled on Tuesday morning with his wife and three children as thigh-high mud approached the front doorway. We started looking around and that is when we saw parts of roofs, and there was a body against our next door neighbour's car. MR COLIN FUNK, who fled with his family as thigh-high mud approached their house. "We started looking around and that is when we saw parts of roofs, and there was a body against our next door neighbour's car," Mr Funk, a financial adviser, said by phone. "I feel lucky," he added. "Some people lost their lives in my neighbourhood."